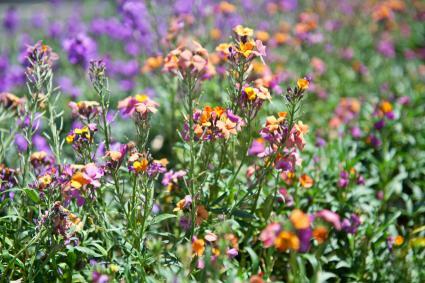 Wallflowers are old-fashioned bedding plants that are easy to grow and hard not to enjoy. They bloom for months on end in bright warm tones and emit a wonderful spicy vanilla fragrance. Most varieties of wallflower are technically considered perennials, but they are short-lived and more commonly grown as annuals or biennials. They grow in short clumps about one to two feet tall and wide with colorful flowers covering the tops of the plants. 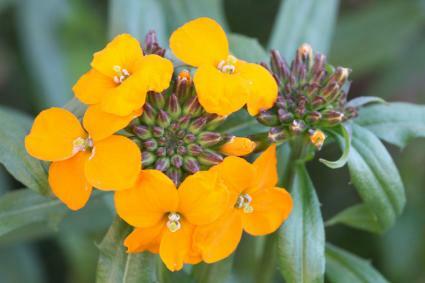 They are sometimes seen with the bedding plants at nurseries in spring, but most gardeners grow wallflowers from seed. They germinate readily and she be sown just under the surface, as they need light to germinate. The ground is warm enough by mid-spring to sow them directly, but it's wise to start seed indoors in late winter to get the plants to a nice blooming size by summer. Wallflowers like full sun and well-drained soil. 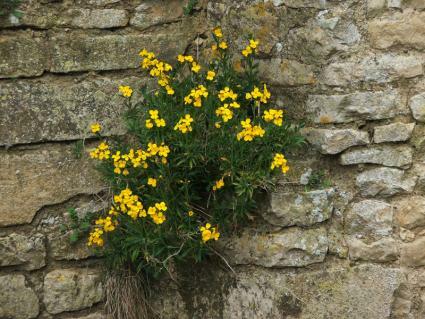 They are the sort of plant that often grows from rocky crags in nature - or from the cracks in a wall, hence the name. This means they tolerate heat and drought well, prefer alkaline soil over acidic soil and sandy areas versus heavy, poorly drained clay. They are generally happy to grow in a raised bed with free-draining garden soil, but they are a great species for bringing color to dry, rocky or sandy soils with low fertility. Wallflowers are commonly used in potted arrangements, as well. The main care needed for helping wallflowers look their best is to trim off the dead flower heads; this keeps them blooming again and again. The plants can be a bit wobbly, so it can also be necessary to provide staking to keep them from falling over in the wind. Irrigation requirements are minimal, but you don't want to let the soil become bone dry; just give it enough water between rains to keep the leaves from wilting. Fertilizer is generally not recommended with wallflowers, as the plants are healthier and produce more blossoms in low fertility soils. Wallflowers are in the Brassica family, which includes many common vegetables like broccoli, kale and collards. Unfortunately, they are prone to all the pests and diseases that afflict their cousins in the vegetable garden, which are numerous. The key to preventing these is to realize that, unlike most of their Brassica cousins, wallflowers are adapted to dry land conditions and are more prone to problems when treated like a typical bedding plant, i.e. planted in rich soil and pampered with lots of fertilizer and water. That being said, you may still find powdery mildew, aphids and a host of other things attacking your wallflowers. Aphids are probably the most likely pests to show up, but they are easy enough to deal with by using a sharp spray of water to knock them off the plants or an insecticidal soap to kill them. In general, it's best to avoid planting wallflowers in a bed that has recently had other Brassicas, as pathogens may remain in the planting area, such as the deadly brassica club root fungus, which is virtually incurable once it becomes established in the soil. There are numerous hybrid varieties to choose from, including the classic red, yellow and orange types, as well as newer wallflower cultivars in cool purples and blues. Bowles Mauve is the color its name suggests and is one of the all-time most popular wallflowers. Apricot Twist has pastel orange blossoms with a strong fragrance. Pastel Patchwork is a multi-colored variety, bearing flowers with a mix of pink, gold and apricot tones. Fragrant Sunshine is a bright yellow variety with red-speckled flower buds. Wenlock Beauty is an old variety with purple and orange flowers. Wallflowers were a favorite among poets of the past, when the plants were as fashionable as roses and dahlias are today. They are still just as beautiful and worth rediscovering in your own garden.